Merge United and Continental points | Flecks of... Gray? United Airlines and Continental Airlines have merged awhile ago and now you can manually merge your points and status’ to one airline. This will likely be done automatically at the end of the year, but if you want to get everything combined a bit earlier, just head to United’s special page and get your points and status transferred across right away. I tried it and it worked great for me. 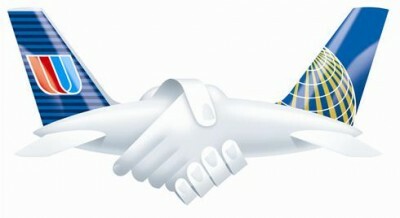 Two planes colliding head-on is probably an apt visual for an airline merger.